Characters or persona’s in bands have been around for nearly forever. From Alice Cooper to Lizzy Borden and everyone in between, musicians creating a sort of different character on stage has always been present. One of the most recognizable ones (in the underground at least) however comes from cult Hard Rock/Heavy Metal group Samson. 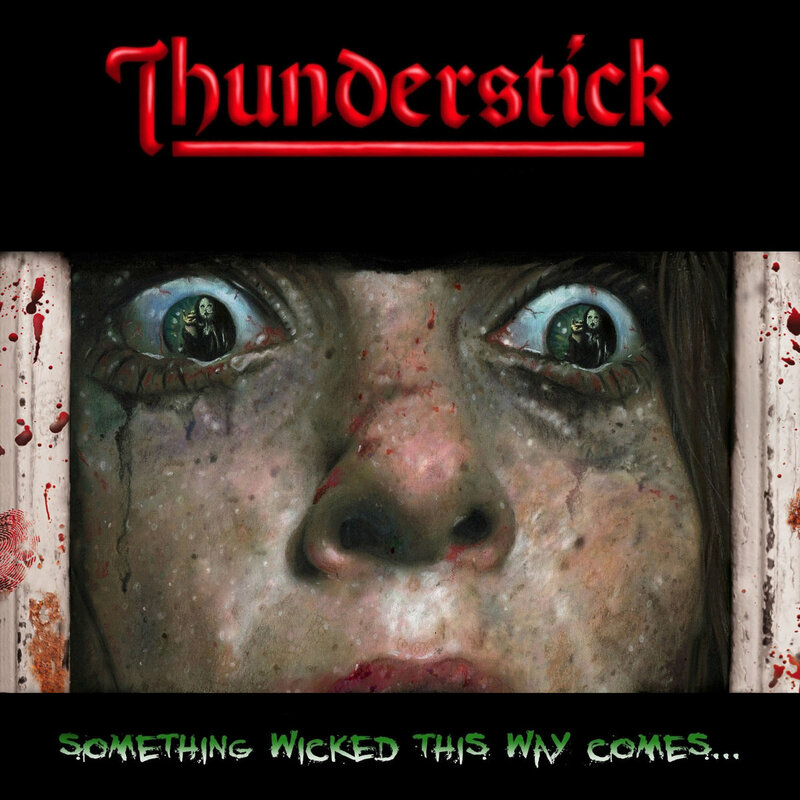 Thunderstick was that musician. Replacing drummer Clive Burr to play on all of the classic Samson albums such as “Head On”, “Shock Tactics” etc., he developed this character who wore a mask playing his kit in a cage which became an image that really helped Samson stand out live. He also was an early drummer for Iron Maiden and has a lot of connections with them but that’s for another time…Recently, he has reappeared on the scene with his solo band after years of being dormant. Entitled “Something Wicked This Way Comes”, we see his style almost come full circle with an extreme throwback to the Samson sound of old. But is it listenable or is it just a cheap throwback of tired ideas? The album right from the start gives off a strong bouncy classic rock vibe more or less what Samson in the late 70’s/early 80’s. Opening track “Dark Night Black Light” is such a fun and very bumping song that has that catchy 70s hard rock vibe with a production that I really like. It definitely has a stripped down production with every instrument being mixed fairly well. Tunes like “Don’t Touch I’ll Scream” and “Fly N’ Mighty” have a very mid 70’s melodic rock feel which work well and are catchy fun rock tunes that get stuck in my head whenever I hear them. Vocalist Lucie V. handles herself great with a very dirty and bluesy rock voice that is one of the biggest highlights on the album. But what about Thunderstick himself? Well he definitely carries the drums wonderfully across the album with that unmistakable very tight style he has always had. My personal favorite on the album is “Thunder, Thunder” as it is probably the most fist pumping song on the album and the most reminiscent of that NWOBHM style. However, the album definitely isn’t perfect as there are a few songs that I tend to just pass over such as “The Shining” which feels just repetitive or even closer “I Close My Eyes” which just feels like a boring ballad and sort of a weaker way to end the album. However, there are enough tracks that redeem the album for the few boring moments it can have. Overall, The album is a simple fun nod of the old Hard Rock style of the late 70’s with a great musician making a return to making music. It isn’t game changing or anything like that but it has some fun charm to it. It is a good driving album and one that any fan of classic rock and old school heavy metal will enjoy. There’s the great songs, the good songs and a few songs that could have been reworked or left off. However, if you are expecting straight up heavy metal you will be disappointing. While the album has some harder edge in sections, it is still a rock album but an enjoyable one that is nice to see pop up on the radar that you’ll enjoy from time to time.